There is an odd stat that will haunt a few… the S&P 500 was down -3.2% last night. 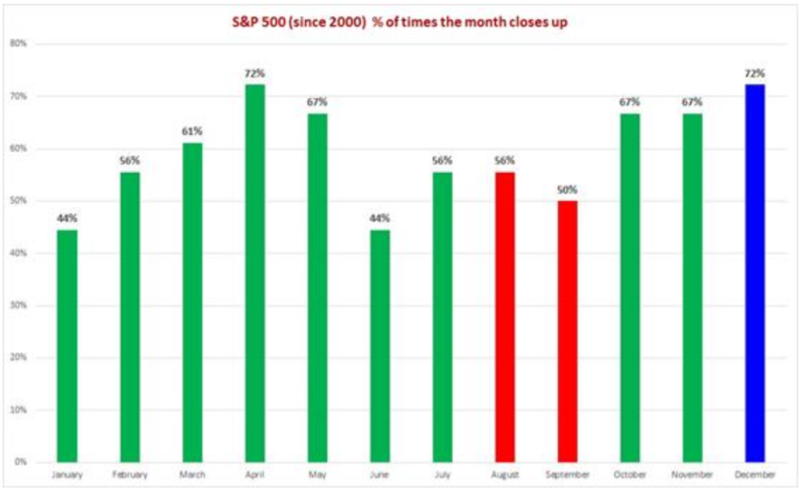 Now there have only been 3 other years where the market has a -3% in December. 1987, 2000 and 2008…. I’ll leave that there, but gee I hate those three years. It’s like three bad nightmares re-lived. The last 3 months has sent many institutions and investors to the sidelines. Is this just a normal -10% shakeout? Or is it the start of a long overdue bear market? 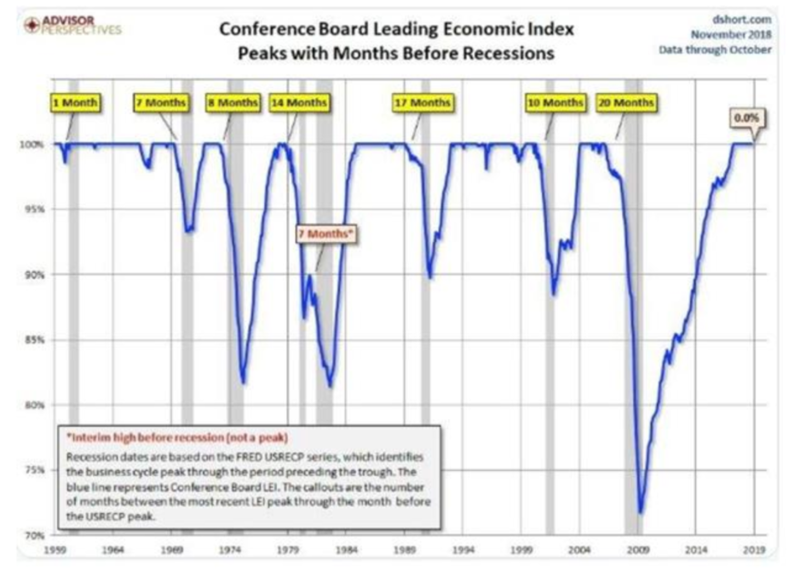 The answer is… when does the US go into recession – If It’s 2020 (or beyond) then it’s a correction – but if it’s 2019 then markets are in for a prolonged tough time. Here in Australia, we not only have the US to worry about but in 2019 we will have a change in Government. New policies will hit the stock market, hit the housing market and thus households, retail and consumption will be impacted. "There is a very good chance that I think Australia will go into a recession before the US. It will be painful as it’s been 28 years since the last recession and many will not see it coming and have no idea how bad it can be." On the economy side, it does not look good and it will get worse in 2019. Australia’s GDP is up just 0.3% (vs. the market at 0.6%) in the 3rd quarter – the weakest pace in two years as a sharp fall in mining investment and a slowdown in consumer spending hit the economy. YOY it came in at 2.8%, vs a downwardly revised 3.1% in the year to June 30 (vs. the market at 3.3%). I now think the RBA will not hike in 2019 but will be forced to cut rates. I have done a complete 180-degree turn on this. "I fear 2019 will be a annus horribilis in the Australian economy. Stock selection will be critical"
Some fear the Fed rate rises may push the US into a recession. History says that’s correct, but there’s a problem. The Fed has not yet hiked enough to bring on the US recession that’s due in 2020, but many now say is coming in early 2019. Looking at the last two market peaks gives us an idea of when the peak may come, and the conclusion (..sorry spoiler alert) is not yet. From 1994 to 2000, the Fed raised interest rates a total of 14 times. When it was done, the Fed funds rate was 6.5%. That period marked the end of the last secular bull market. From 2002 to 2007, the Fed raised rates 17 times, going from 1% to 5.25%. This time around we have seen a 0.25% hike in December 2016. Three more rate increases in 2017 moved the Feds Funds rate to 1.25%. That was followed by three more increases in 2018, all of which were very well telegraphed to the market – all were 100% expected. The consensus now is interest rates will be raised again in December, making it the fourth increase this year. Assuming the December hike takes place, that would make a total of nine increases and will have the Fed Funds rate at 2.5% by year-end. Not too long ago the feeling was the Fed waited too long to start raising rates; now it's the opposite. So given the nine rises this time (from 2016 to 2018) vs (1) 14 times from 1994 to 2000 and (2) 17 from 2002 to 2007, you have to ask, are we really at a point that compares to the previous 2 market peaks? If we listen to experts, they are adamant that we are and this correction is about to get a whole lot worse and morph into an ugly bear Market. 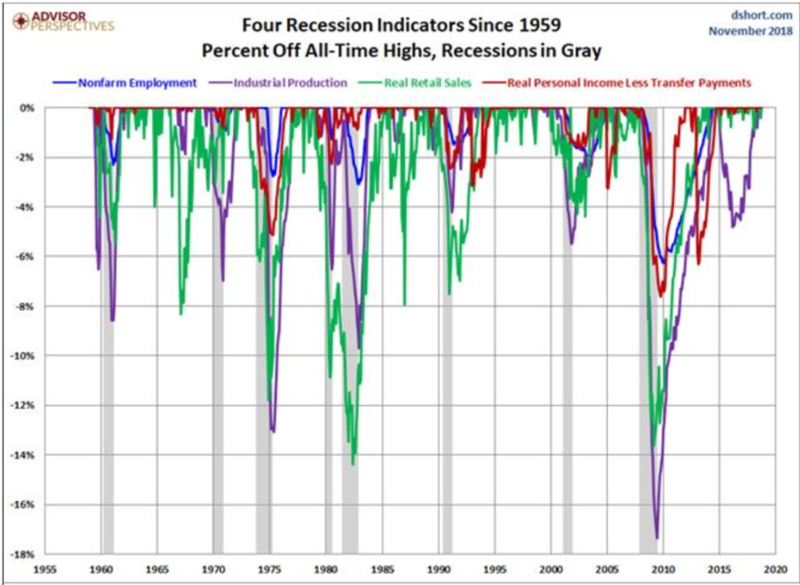 What do the big 4 indicators say about a recession? 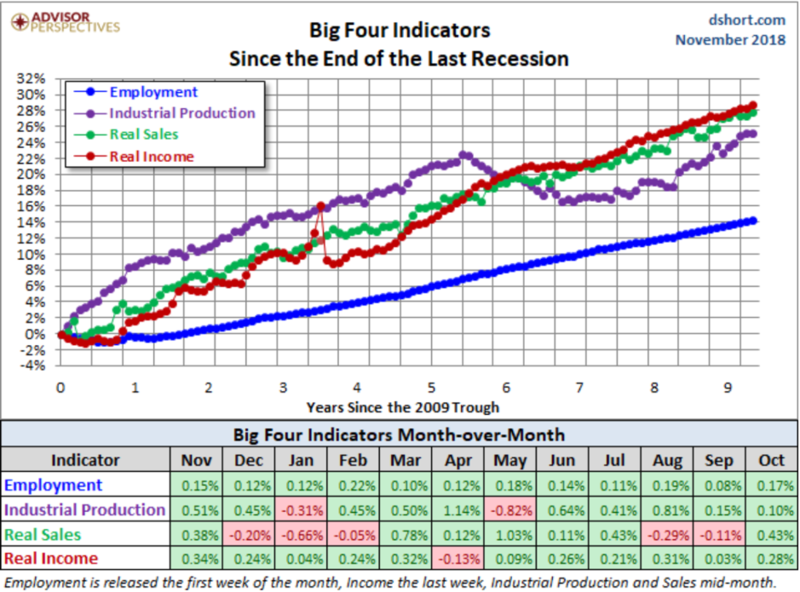 The chart below looks at the performance of the four indicators since the end of the Great Recession in 2008. The data points show the cumulative percentage change from a zero starting point from June 2009. The US economy has been slow in recovering from the Great Recession, and the overall picture has been a mixed bag. Employment and Income have been relatively strong. Real Retail Sales have been rising but below trend. 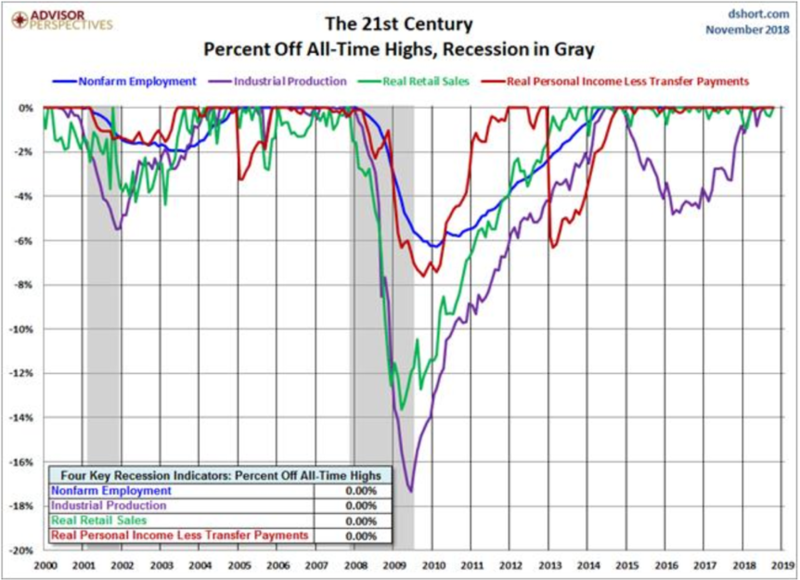 Industrial Production has been slow to recover and has finally been showing signs of improvement. The Leading index out last week was up +0.1% to 112.1 in October, another record high. It follows a revised 0.6% increase to 112.0 in September (was 111.8), which was the first time with a 112 handle. In the past 50 years, it has peaked a median of 10 months before the next recession. However, consider this. 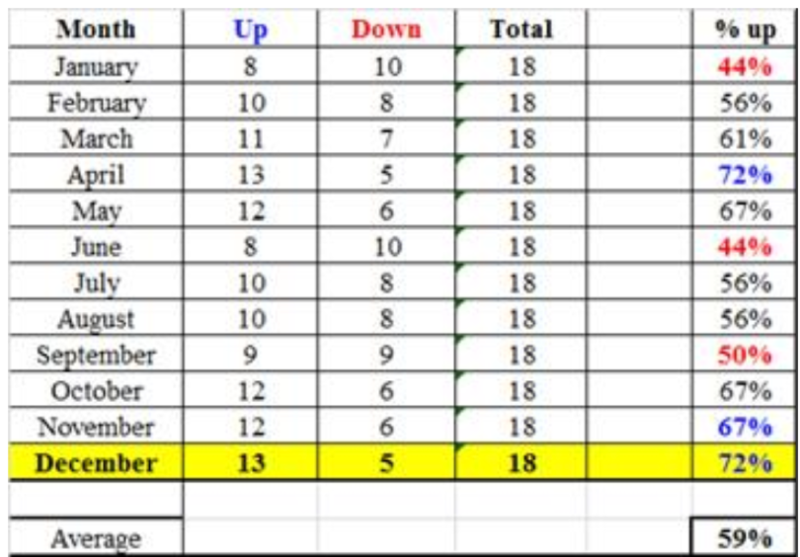 December has consistently been the best month for closing higher. Since 1950, December has been up 75% of the time.